Finding the right meeting space rental in Ottawa or Toronto for your business needs can be more complicated than you would imagine. There are a lot of different factors that need to be taken into account. Meeting rooms can be used for a variety of purposes: staff meetings, client meetings, training workshops, or conferences to name a few. However, the wrong type of meeting room can hamper your success. Whether it’s to close a deal with a client or meet with shareholders, you need the right venue for your specific needs. We previously wrote about some things you should consider when choosing meeting room rentals for your business. Now, here are five additional things you should keep in mind when looking for Ottawa or Toronto meeting space rentals. There are many different types of meetings, including seminars, board meetings, and focus groups. You need to choose a room that will complement your agenda. If you are going to be doing presentations, then you may need a whiteboard or projector. If you are meeting board members or clients, then you will want a meeting space that projects professionalism. Workshops or meetings with catering or activities require different set-ups. At Innovative Professional Offices, we have a variety of meeting rooms for all sizes and functions, holding anywhere from two to 30 people. You cannot expect any one room to serve every purpose. How many people are going to be attending your meeting? It’s important to make sure that your meeting room can hold all of your attendees. Alternately, you also do not want a huge meeting room if you’re only going to have a small group of people there, especially since bigger rooms cost more money. Figure out how many people you will have at your meeting and choose a room that is appropriate in size. A good rental company will make it easy for you to determine what size of room you need. Innovative Professional Offices has size ranges for all of the rooms we offer. The first thing you should do when looking for meeting spaces is to make a budget and follow it closely. It can be easy to see a venue and try to fit your budget around that, but other aspects of your meeting may suffer. Instead, figure out how much you’re willing to spend on your meeting and then find a rental that fits your needs. Try to choose the highest-quality rental at a size that closely matches the amount of attendees, ensuring that you don’t pay any more than you have to. Good meeting room rentals will provide some services and technology that can cut down on your costs. Innovative Professional Offices can scale packages to provide rooms for either large or tight budgets. When you rent a meeting space, you should ensure that the rental has all the facilities you need. These facilities can include projectors, Wi-Fi access, telephone or video conferencing, LCD TVs or displays, and other important tools you may need for an effective meeting. At Innovative Professional Offices, we offer a range of equipment and tools with each of our rooms, as well as additional cutting-edge technology that can be used to create the best meeting. It is the additional services that can provide a special touch to your meeting, impressing attendees and projecting an image of professionalism. For instance, having door greeters who can guide guests to the meeting room can present a professional image, while mid-meeting catering can keep guests happy and provide a needed break. Innovative Professional Offices offers staff for catering, greeting, reception, and administrative tasks, allowing your meeting to function as professionally and effectively as possible. 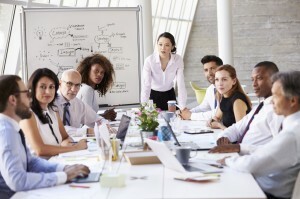 Whether you are trying to impress prospective or existing clients, train new employees, conduct interviews to fill open positions, increase employee productivity, hold a run-of-the-mill budget meeting, or throw a company party, it is pertinent to make sure the space you choose embodies the right atmosphere. The rental office space should be located in a central and safe area. Choose a location that is within close proximity to airports, bus stops, subway stations, and hotels. It goes without saying that this decision should partly be based upon locations that require the least amount of travel possible for your attendees. Of course, convenience should not equate to compromising on safety. The security of the area in which you are conducting your business as well as the well-being of your attendees should be the top priority. Research the crime rates in any given area to ensure the lives of your attendees will not be endangered in any way. Pay attention to any obvious potential physical threats and make sure that the office rental space company you hire is adequately equipped to deal with unexpected circumstances and emergencies. If you are hosting an all-day conference, it might be a good idea to briefly review a few safety rules with your delegates, guests, and other attendees and provide maps highlighting all of the safety exits in case of an emergency. When you first contact an office rental company to check on available dates and meeting rooms, take note of how long it takes for them to respond to your query. This could be a huge indication of the kind of service you can expect to receive from them if you choose to give them your business. If they take too long to get back to you or you constantly have to contact them to get an answer, it means they are not a reliable candidate and you should look into other alternatives. The best and most trustworthy form of advertising is direct word of mouth. As a business professional, you most likely have a lot of contacts with experience in planning and hosting meetings and business functions. Ask them to refer you to a reputable and well-known office space rental company in Ottawa that suits your needs. While referrals from colleagues, friends, and other business professionals are very useful, when it comes to the office space rental selection process, these are just starting points. At the end of the day, the most important perspective in this matter is your own. You know what kind of atmosphere you want to convey at your event, so listen to what others have to say, weigh your options, and then do what makes sense to you. Visit the location for yourself and see what you think of it. Determine for yourself whether this specific office space rental company complies with your business’ requirements and values, and then decide based on your gut instincts. Need a meeting room rental? Innovative Professional Offices offers fully-furnished executive office suites for rent in Ottawa, Brampton, and Mississauga. For more information, contact us today!